Daryl Grubb and Louise Joy (UWC 1954) with Jayden Galbraith, Sarah Winter-Irving, Emily Hoyle and Tala Vaughan. 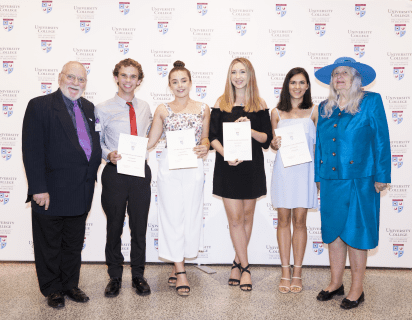 President of Council, Jane Peck and Head of College, Dr Jennifer McDonald welcomed 110 students, donors and guests to Syme Dining Hall for the 2018 UC Scholars Dinner on Wednesday 14 March. Dr McDonald thanked those in attendance for their ongoing support of the UC Scholarship Program. 59 scholarships were allocated to 52 students in 2018, up from 37 scholarships to 35 students in 2017. “I am so proud to work within this supportive community. We are grateful to have alumni and donors who show such a keen interest in our students by enabling access to UC through scholarships” said Dr McDonald. For more information on events and development at University College, please contact the Advancement Office via email at community@unicol.unimelb.edu.au or phone +61 3 9349 9113.